SpaceX technicians work on the Dragon vehicle that will undergo a key “pad abort test” that’s scheduled for May 5, 2015. SpaceX plans to conduct a crucial safety test of its crew-carrying Dragon spacecraft two weeks from now. The private spaceflight company aims to subject a Dragon test vehicle to a "pad abort" trial at Florida's Cape Canaveral Air Force Station as early as May 5, NASA officials announced this week. The unmanned test will demonstrate how Dragon might respond in the event of a problem during launch. "The ability to abort from a launch or pad emergency and safely carry crew members out of harm’s way is a critical element for NASA’s next generation of crew spacecraft," NASA officials wrote in a statement Tuesday (April 21). "The company will have a four-hour window [on May 5] to conduct the test, beginning at about 9:30 a.m. EDT," they added. "SpaceX has an additional test opportunity on Wednesday, May 6." 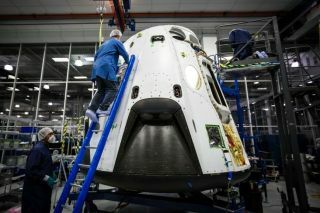 Dragon will sit atop a truss structure, rather than an operational SpaceX Falcon 9 rocket, during the pad abort test, company representatives have said. If the trial goes as planned, Dragon's onboard thrusters will fire up and lift the test vehicle away from the launch pad. An instrument-studded crash-test dummy will sit inside Dragon, which will ultimately splash down in the Atlantic Ocean with the aid of parachutes. SpaceX also intends to perform an in-flight abort test, during which Dragon will launch atop a Falcon 9, sometime after the pad abort trial, company representatives have said. The unmanned version of Dragon already flies to the International Space Station. SpaceX holds a $1.6 billion deal with NASA to fly 12 robotic cargo missions to the orbiting lab using Dragon and the Falcon 9. The duo lifted off on April 14, kicking off the sixth of these resupply runs.